This year, Toyota Indonesia conducted Toyota Sports Day at Sunday, August 30th, 2015. This annual event was held at Gelanggang Mahasiwa, Soemantri Brojonegoro, Kuningan – Jakarta.Special for this year, the Committee added some Indonesian's local games such as Balap Karung, Kipas Balon, Teriak Merdeka and Sepeda Lambat to also celebrate the Indonesia's 70th Independence Day. Those simple-yet-fun games could add the excitement of Sports Day. Toyota Indonesia's members from Sunter, Karawng and Cibitung were actively participated in this event by giving their best effort. 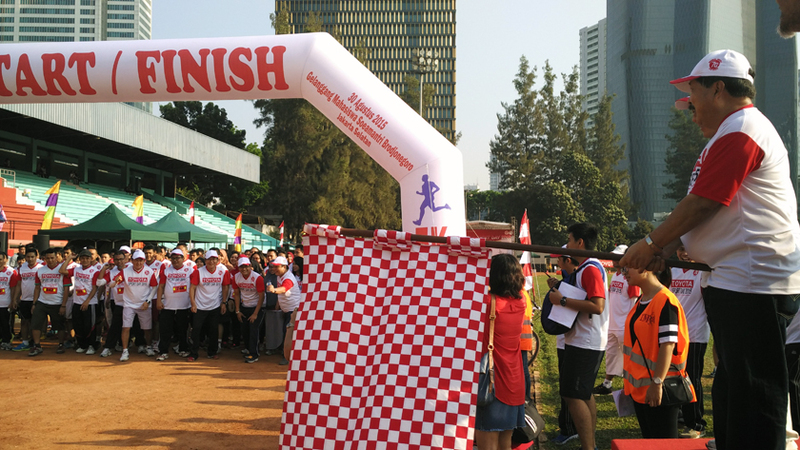 The purpose of Toyota Sports Day is not just to remind them of the importance of regular exercise to maintain their health, but also to strengthen the relationship among Toyota Indonesia's big family, not just horizontally (cross function and area) and also vertically (cross level and position). On this opportunity, the members could blend in and having two way communication even with the Board of Directors and Senior Managements. Other races which also conducted are 5K Run, 2.5K Fun Run, and Fun Bike. Special for 5K Run which had been regularly held as a selection for candidates which will participate in EKIDEN. Ekiden run race itself is held in Japan with the aim of tightening the friendship between Indonesia and Japan. In addition to a variety of sports-related activity, Toyota Sports Day 2015 also conducted arts contest such as Band and Parody Performance.